WhatsApp in very popular and fast growing instant messaging app around the world. If you need to check last seen of your friends, colleague or family members on WhatsApp then you have to open the incoming message. But this guide helps you to check WhatsApp last seen without reading the message. Most of the person curious to know about latest features or hidden trick of WhatsApp. Different latest or upcoming version of WhatsApp provide different interesting features for his WhatsApp users. Around the world WhatsApp is widely used by billion of users around the world. If you have an updated version of WhatsApp on your Android, iPhone or Windows phone then you will get benefit to use latest features. In previous old version of WhatsApp if you want to view last seen of your friends, family members or others then you have to open the message and then check the profile. Now, WhatsApp latest version allows you to check WhatsApp last seen without reading the message of your friend, family members or others without any extra effort. To do this job you just have to take few simple steps which is given below, have a look. Step 1: First you have to tap on the WhatsApp on your Android, iPhone or Windows phone. Step 2: Turn on your Whats Last seen on your device by tapping on the three vertical dot button on your WhatsApp window. Tap on the Settings > Account > Privacy option and turn on your WhatsApp last seen. Step 3: To check WhatsApp last seen without reading the message then select the latest incoming message of your friend or other in WhatsApp window. Step 4: Tap on the three vertical dots in WhatsApp chat window and tap on the “View Contact” option. 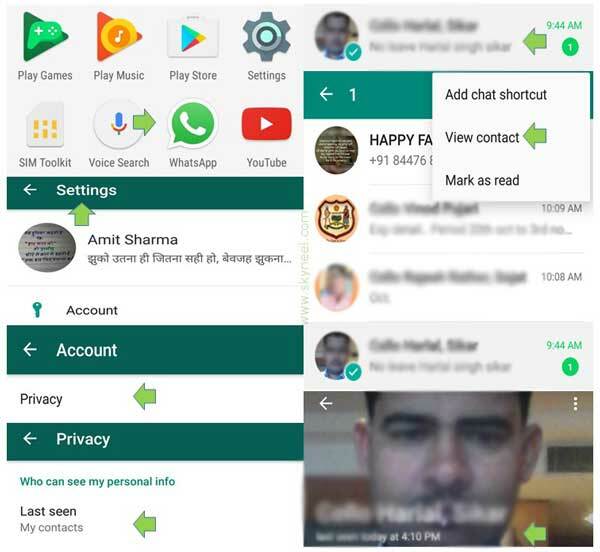 Now, you will get the profile page of your friends, others on WhatsApp. You can easily check WhatsApp last seen without reading the message. I hope this guide is useful for all those guys who want to know more about secrete tips and tricks of WhatsApp. After reading this guide you can easily check WhatsApp last seen without reading the message. If you have any suggestion regarding this guide then please write us in the comment box. Thanks to all.